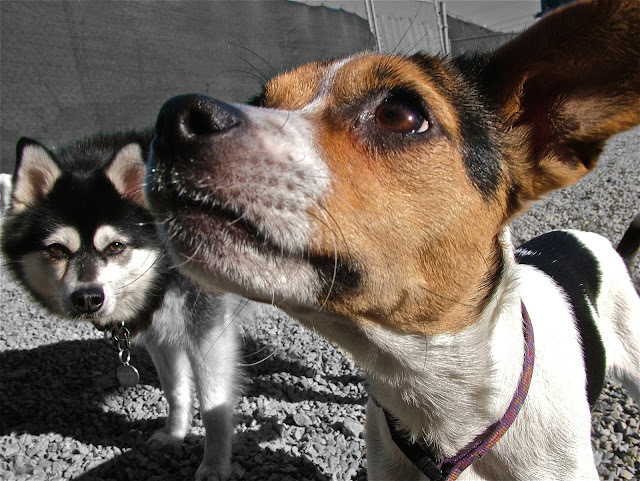 Mark's Dog Blog: I Wish My Dogs Could Talk - Not. I Wish My Dogs Could Talk - Not. They get a cut or a scrape. Have runny poop and an upset stomach. They come back with a lump on on their face. Maybe a bite or a sting? The limp that lasts for a couple of hours, then miraculously heals itself. The projectile puke, with no apparent cause. Whatever the reason, it's at this point that I wish my dogs could talk. It would make life so easy. I could understand what happened while off in doggie play-land. We could fix things so quickly. There'd be no guessing games. I could get the right medicine, the right treatment the first time. Whoa! Slow your roll. Let's get back to reality. I am so glad my dogs can't talk. It would be just like having another human around. Is that not the reason for having a dog in the first place? They are not humans and can't talk. Yay! I love my dogs. If they could speak, I might not. When you come home from work, their whole bodies are wagging because they are so glad to see you. That could never be replaced by a "hey, how are you. How was your day?" Instead of the frantic tail wagging and exuberant bouncing when it's almost time for dinner, you would get a cursory "I'm hungry." Yet again, I'll take the wagging and bouncing any day. No thanks - no talking dogs for me. I love guessing what they are trying to say anyway. During my doggie conversations, I ask them questions, and when no one is looking, I answer for them in my special doggie voice. Tailored specifically for whichever dog I am talking to at that moment. I know you do it too, don't lie. If they get hurt or feel unwell, of course I feel bad. But if I had a dog like me, and it got sick - Ugh! I don't think I could deal with that. Listening to me when I'm sick is a full time job. Yes or no on the talking dog? What do you think? kinds of experience, therefore it's nice to read this weblog, and I used to pay a quick visit this web site daily.